The 2014-2015 Rutland Raiders wrestling team has paved the way to a bright future. The team, though small, wrestled tough and were very close to taking the state championship. Senior Shane Warner, who battled two serious injuries earlier in the season, finished runner-up in the state in a close finals match with Jacob Woodside from Mt. Anthony Union High School, Bennington. He finished his career with over 90 victories and placed in the Vermont States twice. Warner will be dearly missed by his teammates, but his legend will inspire young athletes returning next year. Warner competed at New England States on March 6-8. Mark Napolitano and Dakota Peters also wrestled extremely tough this season—keep an eye on these two, many look forward to seeing how far they can go. Napolitano is a first-year wrestler who proved he has toughness and heart. 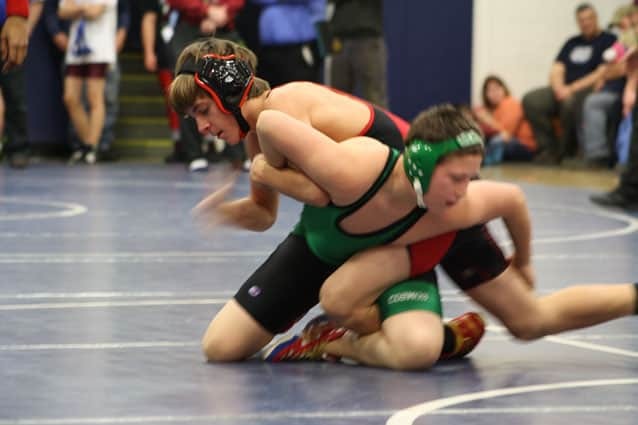 Peters, an eighth-grader who has wrestled in Ohio for the past five years, will join the Varsity team next season. He placed fifth in the state and was in arguably the toughest weight class. Peters will travel to Boston to wrestle in New England States on March 15. Coach Matt Tuscano has been involved in the sport of wrestling for over 20 years and was a state champion at Fair Haven. He continued his wrestling career while at University of Southern Maine for four years. He puts in over 12 hours of coaching a week, plus 10 hours during wrestling meets on the weekend. In the past, Rutland has struggled with numbers; however, Coach Tuscano is working on building the program. His goal is to put Rutland wrestling back on the map, to make the team something the entire community can be proud of and look forward to for the next several years.